This stuffed animal has crossed my path twice in recent weeks. I believe it's supposed to be a caterpillar. But actually it's a centipede. A really colorful, fluffy centipede. Look past the exaggerated cartoon features and it is without a doubt a centipede; a many segmented animal with one pair of legs per segment. But how many kids want a cuddly centipede? Probably not many. 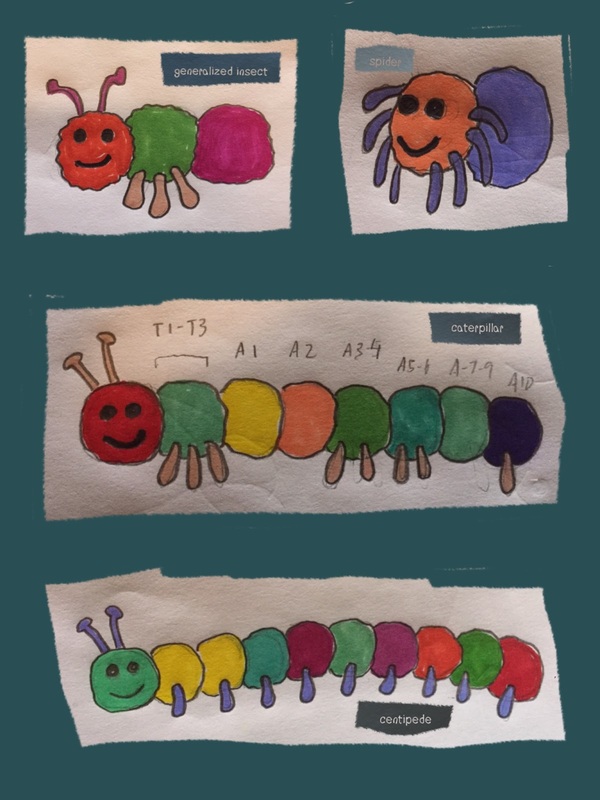 I'm pretty sure the intention was to make a caterpillar so why wasn't a bit more attention placed on the arrangement of legs so it looks more like a caterpillar? I'm fine with animals being depicted unrealistically, abstracted, or with anthropomorphic features. But there's a fine line for me between creative license and dumb, uninformed design choices. Admittedly this line of mine is vague and idiosyncratic, but I think it boils down to to something simple and consistent: do the deviations from reality made in depicting or crafting an animal somehow support or enhance the purpose of that particular depiction. For example, an animal speaking in a story might advance the plot or make for a more interesting character. Let's see how this works out practice, using the stuffed animal pictured above as an example. I'll go through each feature and explain why I'm ok with all the cartoon, anthropomorphic features of this toy, but that the leg arrangement clearly means it's a centipede. The face is smiling. Neither centipedes nor caterpillars can smile, having no lips, and a more realistic face for either would seriously compromise the cute factor of the stuffed animal. Two simple eyes. Centipede eyes vary from group to group. Some have no eyes, others have two or more simple eyes and some like the common house centipede (Scutigera sp.) have compound eyes. Caterpillars typically have six pairs of simple eyes. Our stuffed animal has two, apparently simple, eyes. This detail would indicate centipede, but I'm willing to let it go, because two eyes greatly increases the approachability factor for kids. Two antennae. Check, appropriate for both groups of animals. Multiple colors. I'm ok with the color scheme. Caterpillars and centipedes come in a variety of colors. The rainbow assortment adds an additional element of imagination and fun. Fluffy. It's a stuffed animal, it better be fluffy. So far all these features, though not realistic, are ok with me because they enhance the the appeal of the toy. Number of segments. There's quite a range for centipedes, from fifteen up to one hundred and seventy-some (sources vary). They always an odd number of leg pairs, so despite the name centipede meaning "hundred footed" they can never have one hundred feet. Caterpillars generally have fourteen segments: one head, three thoracic, and ten abdominal. You could also group each type of caterpillar segment together for a total of three segments, as is generally done when describing insects. This is where I start to question the caterpillar identity of this toy because it has seventeen body segment. Number of legs per segment. Centipedes have one pair of legs per segment. Caterpillars have three pairs of legs, one per thoracic segment, and usually five pairs of prolegs, one pair each on abdominal segments three through six and ten. I'm very willing to allow thoracic legs and prolegs to be made the same way on a toy, but this stuffed animal clearly has one pair of legs per segment, which clearly indicates a centipede. There's no reason to do this if your intention was to make a caterpillar; it doesn't increase the toy's appeal or make it more fun or cuddly. It just makes it a centipede. 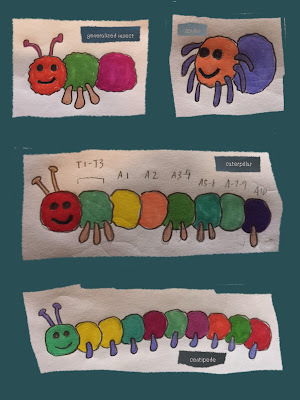 If they wanted a caterpillar, they should have paid more attention to the number and arrangement of legs.